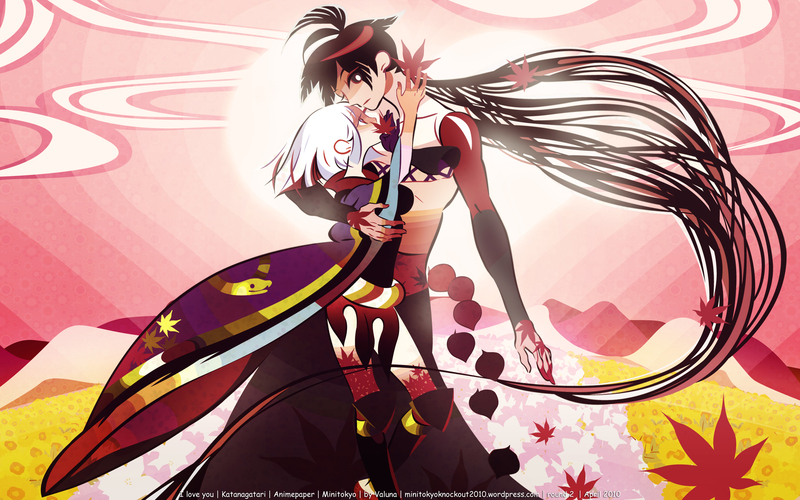 Katanagatari Wallpaper: "I love you"
Minitokyo »	Katanagatari Wallpapers » Katanagatari Wallpaper: "I love you"
I finally found the right time to fix up this wallpaper from the recently finished Minitokyo Knockout Competition (round 2). I know I should have done this a long time ago but I couldn't be bothered with Illustrator being so laggy. I chose Katanagatari mainly because of it's unique art style. The series also had many great scans, ended up using this one. I vectored it, and added a different background as it would have been too empty and non-creative. So instead, I created one myself trying to copy the exact same style (I'm completely not used to it). The colors are more in the same color scheme now, I also changed the pink, made the heart white (it really is better) and changed the lighting after getting kicked out the competition. I can't be bothered making it any longer, so I hope this is enough and better than before. Very unique pic u chose to vector. It's beautiful. Love the vectoring, the bg, and colors. Like bakemonogatari,i love the studio which make this manga ! Also love the patterns you used. Really funky and colorful, I love the abstractness of it. Great work. from where are the characters? i don't know them. love the wallpaper. Thx a lot! 1st katanagatari wallpaper, it looks very nice!